Karthik Subbaraj directorial venture Petta featuring Superstar Rajinikanth, Vijay Sethupathi, Sasikumar, Nawazuddin Siddiqui, Simran, Trisha, Megha Akash, etc in the lead roles is scheduled to release for Pongal 2019. Sun Pictures production house is doing some big scale promotions both in online and offline. The first song from the movie named ‘Marana Mass’ came out on 3rd December and it has been creating some terrific records on Youtube. The second song named ‘Ullaallaa’ drops tomorrow (7th December) evening at 6 pm. Music director Anirudh Ravichander has revealed the singers and lyricist of the song. 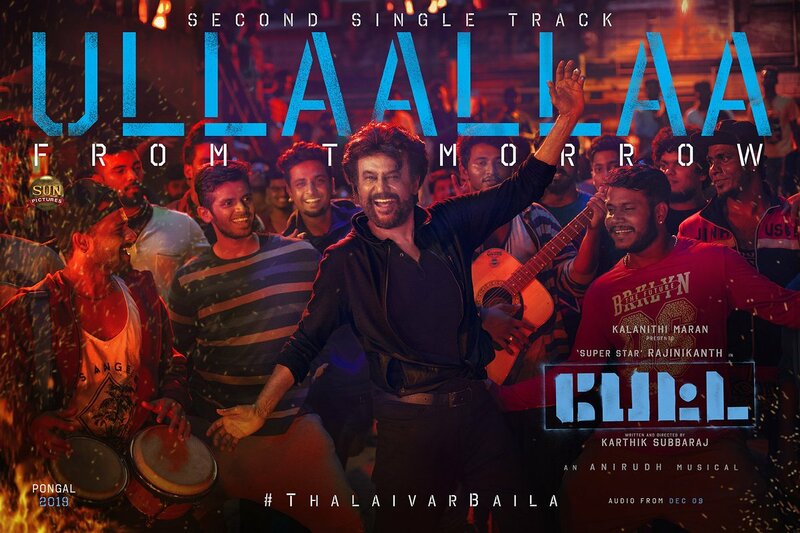 ‘Ullaallaa’ from Petta is sung by Nakesh Aziz and Inno Genga. Lyrics penned by Vivek.